How is best to deal with dog's fear of fireworks? Many dogs are frightened of fireworks. In the UK, it is estimated that around 45% of all dogs show signs of fear when they hear fireworks. This not only means that dogs are afraid in their own homes. Record number of dogs goes missing during firework displays. Petlog (UK largest database for micro-chipped pets) receives up to 40% more calls about missing pets on Bonfire Night (November 5th) than any other days. It is therefore important to help your dog to get used to fireworks and other potentially stressful situation. The sooner you start the better, as the problem is likely to escalate over time if not dealt with early on. If not addressed, the dog's fear of fireworks can develop into dog noise phobia, i.e. persistent, excessive, and irrational fear response, which can be difficult to deal with. It is usually easy to detect if your dog is scared of fireworks or not, but the most common signs include shaking or trembling, pacing or restlessness, seeking shelter, staying close to the owner, inability to eat, destructive behaviour, loss of bladder or bowel control, etc. The more severe the signs, the more likely it is that your dog is suffering from dog noise phobia. It is best to start preparing well in advance. This may not always be possible, e.g. if some of your neighbour is having a party you did not know about. However, you can prepare in advance for all the major firework displays, like July 4th (US), Bonfire Night (UK) and New Year’s Eve. Your dog may already have his own safe place, i.e. where he goes when he wants to be left in peace. This can be a crate, or behind the sofa. Our dogs love to sleep under our desk while we work. If this is the case, then you can use this as his safe haven during firework displays. Just make sure it is as safe and cosy as possible for the big night, e.g. by covering the crate with extra thick blanket to damper the noise and leave his favourite toys in there with him. If your dog does not have his own secure place, or his place is away from where the family is spending their time during the firework display, then you may want to create special den for the evening. If you have a crate, then it can be ideal. You can also use his bed but put it in the quietest corner of the room, ideally under a table or behind a chair as dogs find "den like" spaces comforting. Never confine the dog in the den, as it could dramatically increase his stress level. Always leave the crate door open, so the dog can go in and out as he pleases. Make sure all doors and windows are securely locked so your dog cannot run away if scared (it also helps to reduce the noise level). If your dog has to relief himself on the night, go with him and keep him on a leash… just in case. No matter how confident you are that your dog cannot run away, make sure he has his collar on during firework displays. And make sure the collar has your correct contact details. And your dog is of course micro chipped, right? Closed doors and windows reduce the noise from the fireworks. Also, draw the curtains. It dampens the noise even more, as well as the flashing lights. Provide distraction noise, e.g. turn on the radio or TV, or even the washing machine. White noise, like fan or air conditioning, can also help. Some dog owners use earplugs or cotton balls for their dog's ears but be careful if doing this (you may want to discuss this option with your Vet first). Offer your dog his favourite toy or treat to try to distract him. You may even have special toy / treat only used on special occasions like this. You can also try to tempt him into his favourite game. This may work well for some dogs, but not others. The sooner you start to associate something nice or fun with fireworks, the more likely it is to work. Give your dog extra vigorous exercise on days when you expect fireworks displays (this should be done during the daylight hours when little risk of fireworks going off). Exercise will make your dog tired, both mentally and physically. This will make him less responsive to noises. Exercise also increases the natural serotonin levels in the body (acts as sedative). Feed your dog well in advance, as he may be too anxious to eat once the firework starts. And make sure he has access to enough fresh water. Anxious dogs pant more and therefore need to drink more. Do not leave your scared dog alone during firework displays. If you cannot be there, get someone the dog trusts to be with him. Actually, another dog that is not scared of fireworks could help to calm your dog down. So if you have friends with dog like that, you may want to invite them both over on the night. Our dogs are very aware of our mental state. It is therefore important that you stay calm and ignore the noises yourself. We can reflect our behaviour on our dogs. If we are worried or nervous, we add to their fear. Our dogs look to us for direction, so try to be calm, upbeat, and show your dog that you have everything under control, that you are in charge. Under no circumstances punish your dog. As importantly, don't over comfort him, it will just reinforce his feeling that something is wrong and he is right to be scared. The best thing is to ignore fearful behaviour and leave the dog alone in his safe place. I know, this is easier said than done but it is what is best for your dog. 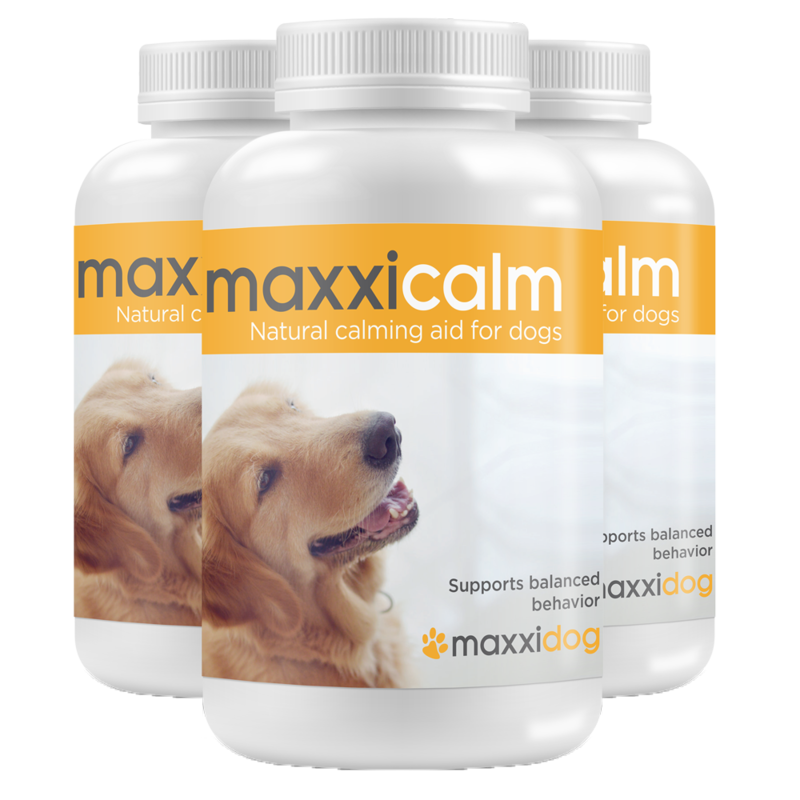 Natural calming aid for dogs, like maxxicalm, can help your dog to relax during fireworks displays. You should still apply the above rules, but good quality calming aid can really take the stress out of the situation for your dog… and you. For best results, you should give dogs afraid of fireworks remedy for couple of weeks prior to the big night. These tips should help you and your dog to reduce his fear of fireworks. Your dog is unlikely to start enjoying them, but you can help him to learn to live with them. However, in the worst cases, you may need to seek professional help. In those cases, behavioural therapies like systematic desensitization and counterconditioning may be helpful. Sometimes, prescribed medication may be required as well (the last resort for most dog owners). Fireworks are scary and stressful for most animals. Record number of dogs go missing every year during firework displays. Our checklist will help you to prepare your dog for night of firework displays. The sooner you start preparing your pet the better.